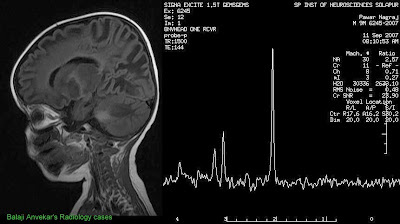 A 9 y o male with severe hypotonia, enlarged head size on clinical examination. 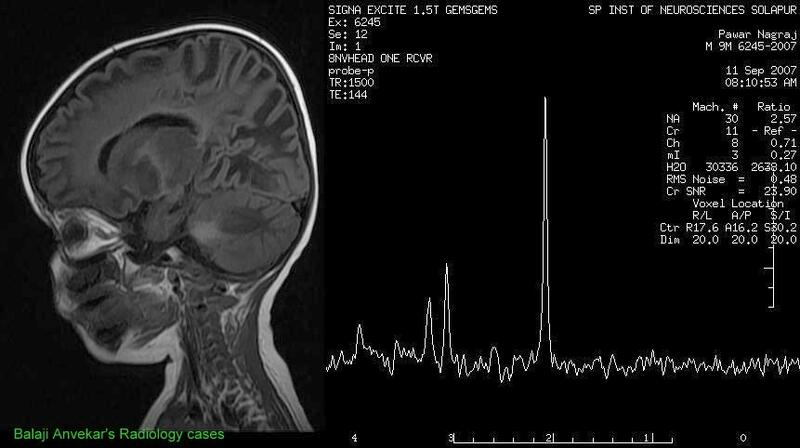 Here is MRI Brain with single voxel MRI Spectroscopy. Axial T2w images with sag T1w image of Brain. Single voxel MRI Spectroscopy performed with a 2x2cm voxel placed in left medial occipital white matter, 99% water supression achieved. Spectral waveform obtained at long TE of 144 ms. Bilateral diffuse T2 hyper intensity involving cerebral cortical white matter, involvement of thalami and dentate nuclei. Sub cortical U fibers are typically involved. MR Spectroscopy shows a sharp and long peak of NAA at 2.02 ppm suggestive of marked elevation of NAA. Imaging diagnosis : Canvan's disease. Ashkenazi descent: Glu285Ala = Non-Ashkenazi descent: Ala305Glu. Deficiency of aspartoacyclase > N-acetyl aspartic acid increase in brain and urine, NAA is neurotoxic > Vacuolization (spongy degeneration) of white matter. Imaging wise diagnostic clue is diffuse confluent demyelination with early U-fiber involvement. Diffuse decreased attenuation of cerebral white matter. Reduced attenuation in globus pallidi and thalami. T2WI : Subcortical U-fiber involvement, centripetal WM involvement. Thalamic and globi pallidi hyperintensity. Progressive cerebral cortical atrophy and cerebellar dentate nuclei involvement in late cases. DWI: Restricted diffusion at affected sites. Lack of enhancement on PC T1. MRS:Marked increased NAA at long TE of 144 or 288. Edematous/gelatinous brain tissue, necrosis subcortical V-fibers. Microscopic Features are spongiform degeneration of white matter. Loss of myelin sheath, sparing of axonal fibers. Three clinical variants: Congenital / Infantile / Juvenile. Congenital (first few days of life): Early encephalopathy, rapid death. Infantile (3-6 months) MOST COMMON: Hypotonia, lethargy, head lag, macrocephaly, seizures, spasticity, optic atrophy. Juvenile (onset at 4-5 years): slower progression. Age at the presentation, usually evident by four months of age. Increased risk for Ashkenazijewish ethnicity. Chronic vegetative state with autonomic crises. Death by the end of the first decade. Age of onset predicts course of disease. Gene therapy and acetate supplementation are under evaluation.